Since I posted My Winter Daily Skincare Routine back in January, several products have been tossed aside for more luxurious, indulgent additions. If you’re a regular reader, then you’ll know I chucked the face wipes a long time ago and ventured into micellar waters. 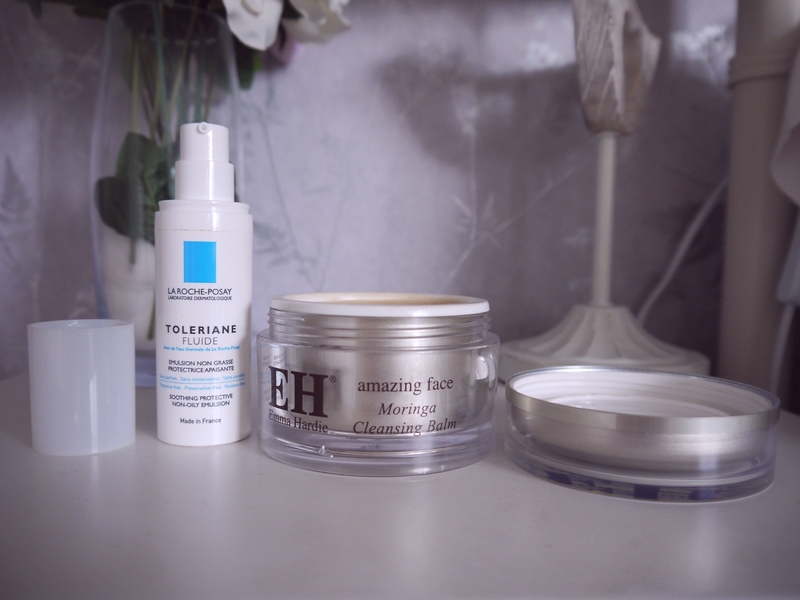 But even they have been replaced recently with something I can safely say I love; and it’s the Emma Hardie Amazing Face Moringa Cleansing Balm. I’ve wanted this product for months; it’s often talked about on the blog circuit and was even recommended to me by a friend. The reasons why I love it? Firstly, it shortens my cleansing routine down to using just this. No makeup removers, no face wash; it’s all done in a good sweep of a damp muslin cloth. Secondly, the scent and consistency of the balm is soothing; leaving my skin clean, but not feeling too tight. I suffered with hormonal breakouts before I started using this and I can only assume that it’s contributed to clearing them up. The luxury of the product is shown in the price, and I was pleased that a mini version came with it (therefore well worth the money and amazing for travelling purposes). I do still use The Body Shop’s Seaweed Purifying Facial Cleanser with a cotton pad in the mornings, but the Cleansing Balm is my go to product to quickly get clean before I scramble into bed. Once that’s off, I’ll apply the Alpha H Liquid Gold. However, I like to only use this a maximum of twice a week. Why? Read my review here. Onto moisturisers. During the winter my combination skin craves moisture a little more than normal. However as soon as spring came along this year, my Aloe Soothing Day Cream by The Body Shop went straight into the drawer and wasn’t seen since. Instead, the La Roche Posay Toleraine Fluid was purchased after seeing a rave review by A Model Recommends. 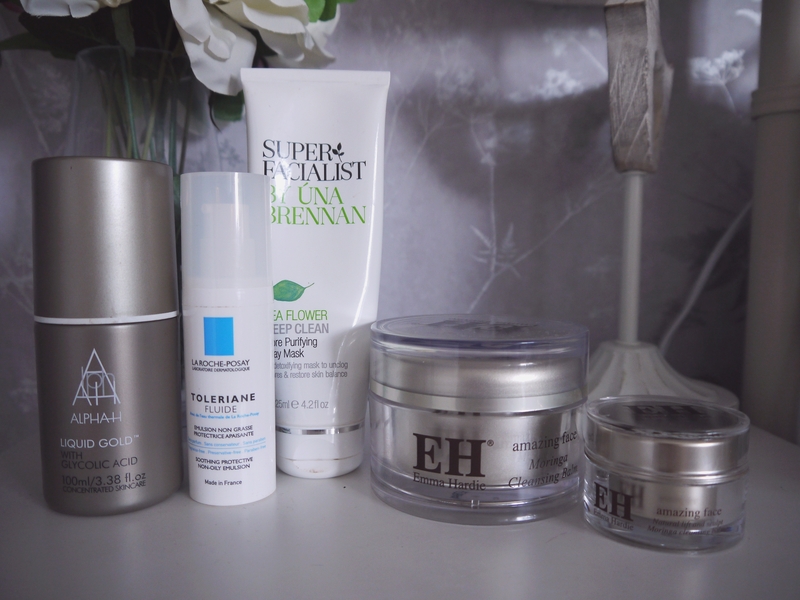 I’d been on the hunt for a worthy moisturiser to combat my combination skin and Ruth Crilly had written a brief post on it (of which I now can’t find, but she has recently made a separate review above). I still use the Effaclar Duo+ often during breakouts, but when everything’s cleared up and I want to take everything back to basics I’ll bring the Toleraine Fluid into my daily routine. It’s light enough to not feel greasy in the slightest way possible, but still injects the right amount of moisture that’s necessary. The pump dispenser is also a bonus for little wasteage. 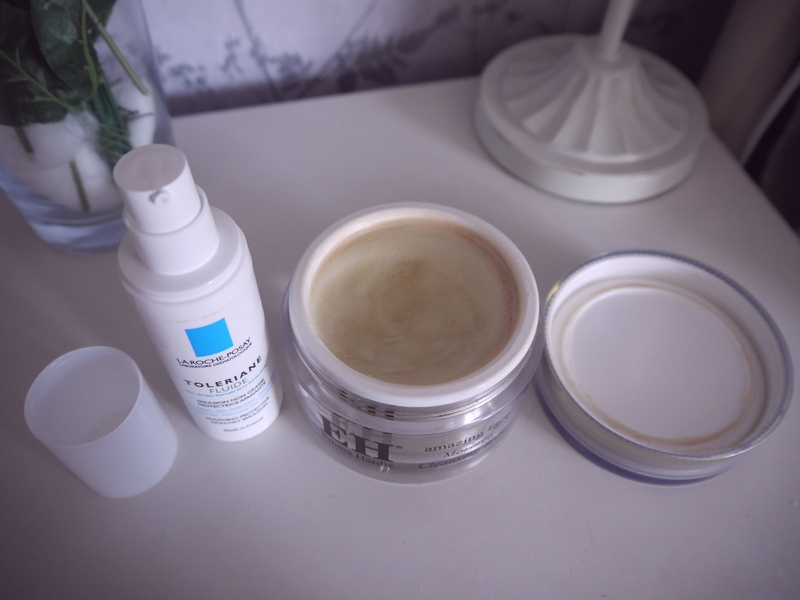 Another slightly more luxurious treat I use on my skin is the Superfacialist by Una Brennan: Tea Flower Pore Purifying Clay Mask. Yes, it’s only (currently) £5.99, but it’s far pricier than my usual 99p Montagne Jeunesse choice of face masks. The real luxury is in the product itself; and you can read more of why it’s in my routine here. So these are the newest products in my daily skincare routine. Have you tried any of them?